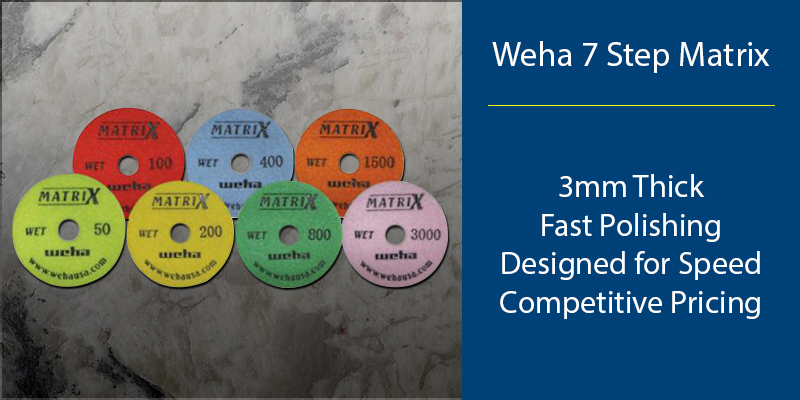 The 7 Step Matrix Polishing Pads system is designed by Weha. It is a polishing system for high production shops. Hence, Matrix pads are versatile, fast, and economical and they get results. Since these pads are compatible with a variety of materials, high production shops choose the Matrix 7 Step. Traditional 7 Step polishing pads do not give high production fabrication shops the speed they want and need. Hence, Weha took a different approach when designing the Matrix polishing pads. By starting over and re-calibrating the 7 step process they have delivered a faster system. This change-up in the grit, matrix, and bond tailors the polishing process. Hence, this configuration is preferable to a high production shop. As a result, the Matrix 7 Step Polishing Pads are a favorite among select high yield shops. Polishing a variety of stone very quickly would be of no value if the cost of the system was exorbitant. Therefore, Weha also took the pricing into consideration when developing these pads. How does the Matrix polishing system compare to other economy pads? They are priced as competitively as possible without sacrificing results. So Matrix pads are made with a specific purpose in mind. Namely, to deliver speedy polishing on a variety of stone at a competitive price.